I recently contributed to an article for eCig One — an ultimate guide to sub-ohm vaping. While I was working on the guide, I found a vaping superstore called Lightning Vapes. Although there is no shortage of sources online for wick and wire, I appreciated the fact that the selection at Lightning Vapes is well organized and includes just about everything that anyone could possibly need for coil building. Lightning Vapes also has a tutorial section for rebuilding various RTAs — almost none of them seem to include manuals — that I found very helpful when I was writing my iJOY Tornado Nano review. I decided that I would buy from Lightning Vapes the next time I needed coil building supplies. I’ve bought from Lightning Vapes twice now, and I’ve had nothing but good experiences. I intend to continue updating this Lightning Vapes review as I try more products. View the Lightning Vapes website. Lightning Vapes ships most products anywhere and accepts PayPal for purchases not including e-liquid. Use the coupon code LV15 for a 15 percent discount on your order. What Does Lightning Vapes Sell? Lightning Vapes sells consumable vaping supplies. They don’t sell e-cigarettes, in other words. Lightning Vapes does sell wires, wicks, batteries, coil building tools, replacement parts for tanks, pre-built replacement coils and the like. They also have their own line of extremely affordable e-liquid, which I’ll discuss shortly. I’ll begin with an overview of the products available at Lightning Vapes. As you can see, it’s a pretty wide selection. 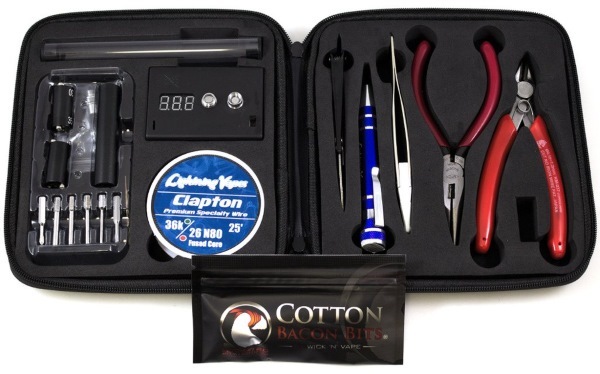 If you build your own coils, Lightning Vapes makes it possible to buy pretty much all of the supplies that you could ever need from one retailer. The prices also happen to be extremely reasonable. About the time that I was contributing to the aforementioned sub-ohm vaping guide, I began to run low on wick and wire. Having seen the very low prices for Kanthal, I decided that my next order of vaping supplies would be from Lightning Vapes. I bought a spool of Kanthal wire and a package of cotton from Native Wicks. The Kanthal cost less than $5.00 for 100 feet of wire. 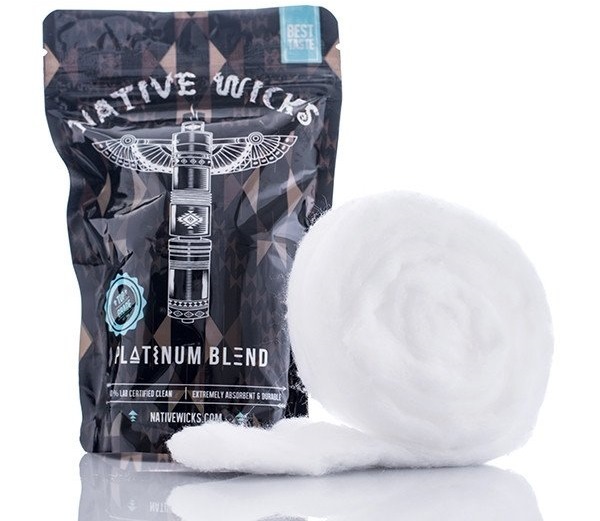 The Native Wicks product was three feet of cotton for $7.99. In all, I spent less than $20 for months of coil building supplies. I’m still nowhere near running out of Kanthal. I paid for my order by PayPal, which was hugely convenient. Native Wicks, by the way, makes an excellent product. I was previously using Cotton Bacon. Comparing Native Wicks vs. Cotton Bacon, I would say that the Native Wicks product is both longer lasting and easier to work with. I attribute both to the very long fibers in the Native Wicks product. It wicks very well and does an excellent job resisting heat. I find that my coils built with Native Wicks last quite a bit longer than those built with Cotton Bacon — although both are infinitely better than the Japanese cotton pads that I was using. Comparing Native Wicks vs. Cotton Bacon, I find that Native Wicks seems to use much longer, sturdier fibers. Lightning Vapes also sells their own e-liquid — and the company’s e-liquid prices are remarkably good. A 30 ml bottle is $6.99, and a 120 ml bottle is an incredible $22. I was paying around 37 cents per ml of e-liquid and thinking that I was getting a pretty good deal. Less than half of that price, though? I definitely had to give it a try. 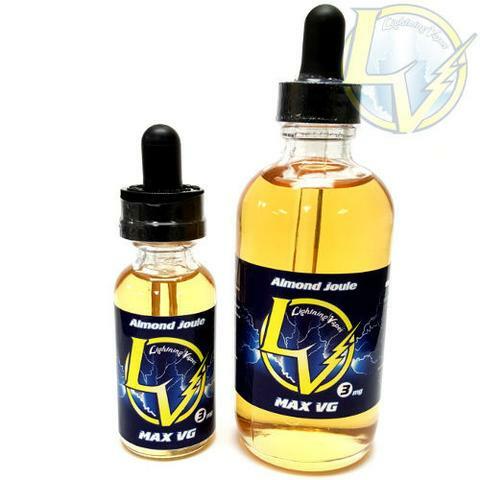 To date, Bread Pudding Pulse is the only e-liquid that I’ve purchased from Lightning Vapes. Since the e-liquid prices at Lightning Vapes are so low, I expect to pick up a new flavor each time I need to order wicks or wire. I’ll update this review each time I try something new. Bread Pudding Pulse is an interesting e-liquid. Lately, I’ve really been into e-liquids with cereal and grain flavors because they provide a nice change of pace from the fruity/tropical flavors that seem to be so common right now. I wouldn’t say that Bread Pudding Pulse quite scratches that itch, but it’s still very pleasurable — and absolutely worth the $22 price for 120 ml. The nose of this e-liquid is definitely custard, but the primary flavors are cinnamon, vanilla and browned flour. If you’ve ever had a sugar cookie e-liquid — like Halo‘s, for example — you’ll find that Bread Pudding Pulse tastes somewhat similar. I enjoy it — especially for the price. I probably wouldn’t buy it again, though.